PLUS: Join in today’s call-in to President Michael Drake’s office! 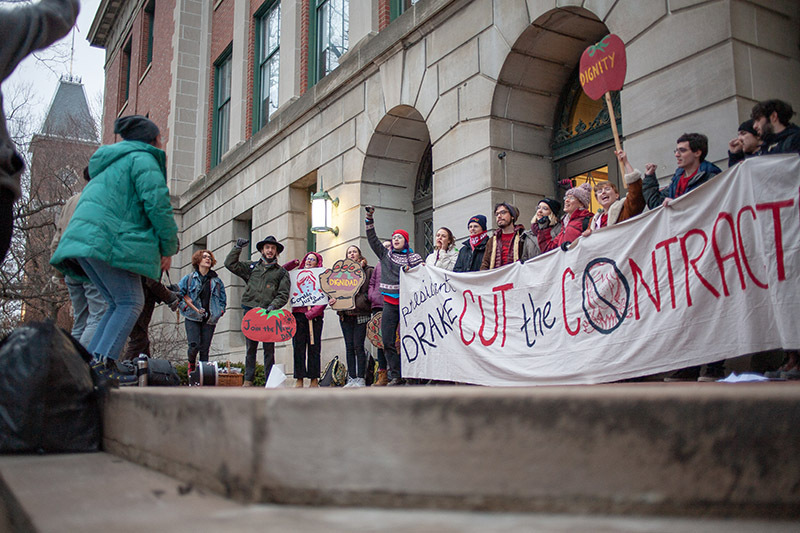 Yesterday afternoon, just ahead of today’s major International Women’s Day march to the heart of Ohio State University’s campus, a group of 25 OSU students, faculty, staff and community members marched to the doorstep of President Michael Drake’s office and launched a sit-in, demanding that the university’s contract with Wendy’s come to an end. The peaceful, student-led action represented a major escalation in the students’ efforts to boot Wendy’s off campus, building on six years of the campus-based Boot the Braids campaign squarely in Wendy’s corporate backyard of Columbus, Ohio. We are here today to demand that you cut OSU’s contract with Wendy’s. Now is the time. Ohio State has been stalling for six years. 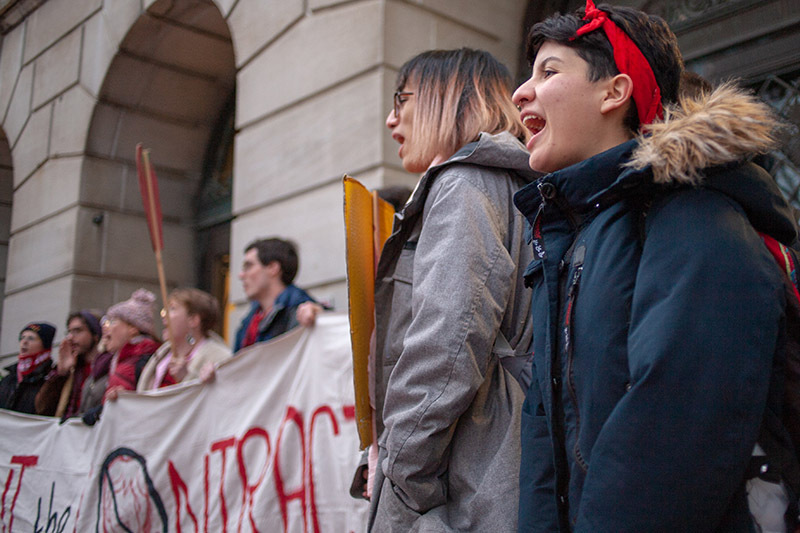 Six years of students, staff, faculty, alumni and community members calling on you to demonstrate Ohio State’s commitment to human rights through one simple action: refusing to do business with Wendy’s until they join the Fair Food Program. You and the Ohio State administration have continually evaded our call to action, prioritizing the public image of Wendy’s over your own social responsibility. We are here today, on the eve of International Women’s Day, to invite you to follow through on your word that you “actively support fair treatment of workers” by cutting the contract. Now is the time. The most recent renewal of OSU’s contract with Wendy’s came with fanfare around Wendy’s updated supplier code of conduct, which the Ohio State administration actively helped design. As has been demonstrated under thorough review from labor law experts, including our own professor emeritus in the Moritz College of Law, Jim Brudney, Wendy’s code of conduct falls far short of the Fair Food Program. While the Fair Food Program is a mandatory code, Wendy’s code of conduct is entirely voluntary. 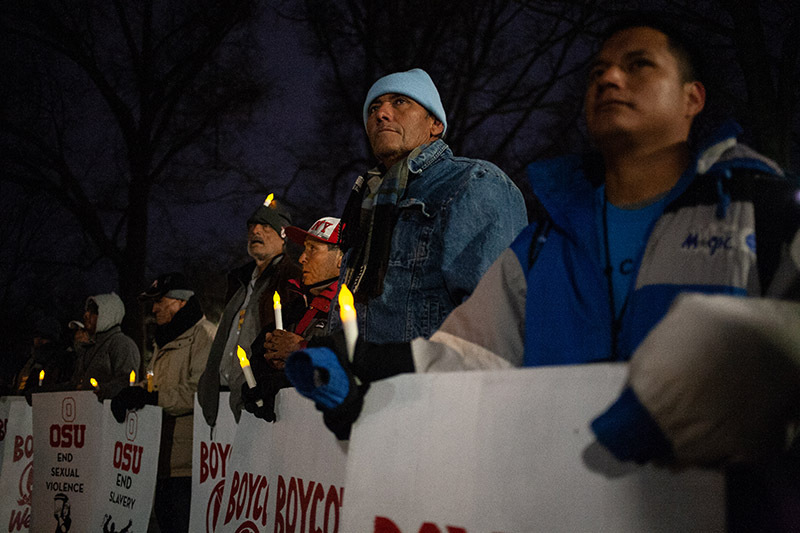 While the Fair Food Program depends upon active and unthreatened participation of workers, Wendy’s code of conduct does not even address the participation of the workers they claim to protect. Last month the University of Michigan, our biggest rival, bravely refused to let Wendy’s back on campus until Wendy’s joins the Fair Food Program. When the Coalition of Immokalee Workers visits the University of Michigan on Saturday, they will be celebrated for joining the right side of history. They will be celebrated for upholding respect for the dignity and freedom of workers. In contrast, your inaction, your stalling, and your continued willingness to do business with a company that is in the national spotlight for its deplorable human rights record, is more shameful than ever. As the wave of public pressure against Wendy’s leads more and more institutions to cut their ties with Wendy’s shameful and evasive maneuvering, now is the time to distance ourselves by finally endorsing the internationally acclaimed and proven worker protection strategy of the Fair Food Program. Now is the time to cut the contract with Wendy’s. Tomorrow, hundreds of people will march through Columbus in honor of International Women’s Day to support the women leaders of the Coalition of Immokalee Workers who are fighting for a world without sexual violence, who are here to face Wendy’s directly to demand their support, and who ultimately will come to your door demanding to know whether you will continue to be complicit in Wendy’s gross human rights violations, or whether you will finally choose to stand with students, women, and farmworkers. Rather than being a day of shame, tomorrow can still be a day of celebration. This is a peaceful sit-in. We refuse to leave until the contract with Wendy’s is cut. Now is the time to rise to the occasion. Now is the time to join University of Michigan on the right side of history. Now is the time to choose celebration over condemnation. Now is the time to cut the contract with Wendy’s. 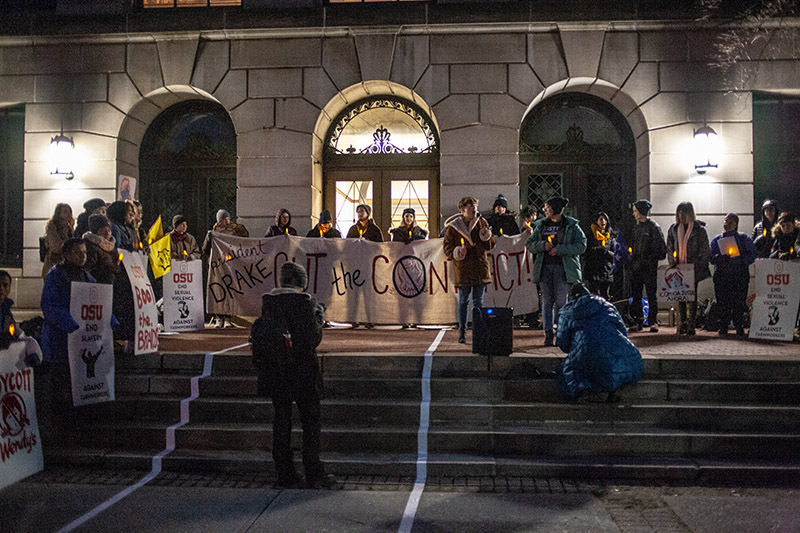 Although President Drake remained behind closed doors in his office while the students’ read the letter, he did make a brief appearance during the sit-in, flanked by campus police. 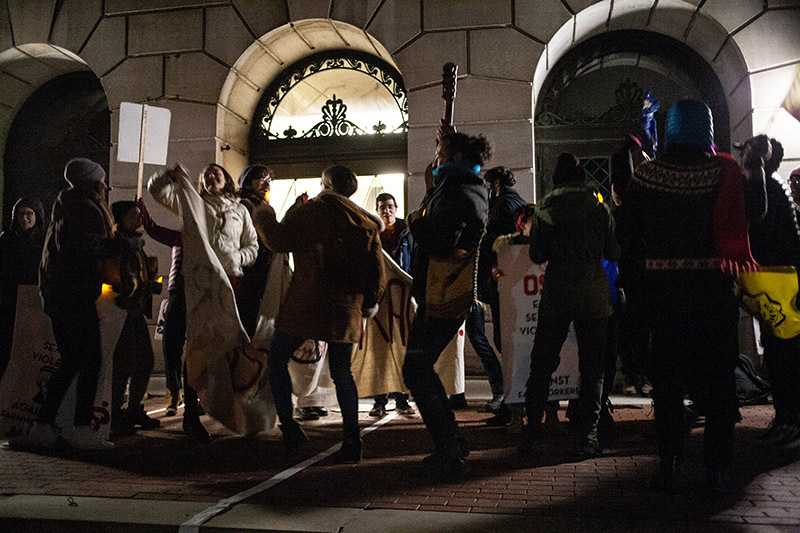 Ignoring students’ questions and demands for a meeting, President Drake emerged from his office and exited the building as quickly as possible, with their songs and chants echoing at his back. By 5:30, as the building was shutting down, a larger contingent of police entered the room and threatened students with arrest if they refused to leave. But even after the sit-in participants were physically forced out of the administration building by both campus security and police into the chilly winter air, their spirits remained high. Singing as they exited the building, students held an impromptu reflection on their experience, solidifying their determination to keep the campaign going. As the evening light faded, the students were joined outside of Bricker Hall by the dozens of farmworkers and their families who had traveled to Ohio for the 4 for Fair Food Tour. 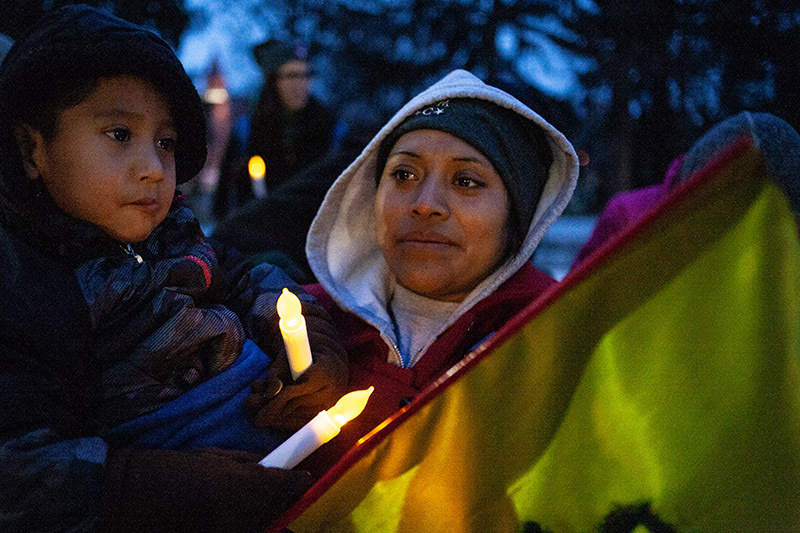 After rounds of song and chants, the crowd listened to a series of moving speakers, ranging from CIW’s Silvia Sabanilla and Gerardo Reyes Chavez to the Rev. Noelle Damico, Amanda Hayes, Intern Minister at the First Unitarian Universalist Church in Columbus, and Rachel Birri, an OSU Junior who not only had taken part in the day’s sit-in, but was one of 19 fasters during the 2017 fast by OSU students, alumni and community leaders. The vigil ended with a burst of energy, as students and farmworkers alike took turns leading chants, warming up their vocal cords for the major march through Columbus taking place today. 2. Ask if you can leave a message for President Drake regarding OSU’s business with Wendy’s tomato purchasing policies. 3. You’ll likely be directed to an assistant. Once you get someone on the line, give your statement. Feel free to offer your own personal comments, or use the script provided below! 4. Post about it! Let us know that you called and invite your friends to make a call, too, on social media. Stay tuned for more on today’s massive action, and more from the 4 for Fair Food Tour, in the days ahead!